So, I reckon demoing all the Geometric range for DoCrafts this year so far has worked its way into my thought process because I felt compelled to design a diecut panel in a similar style for the background on this page. 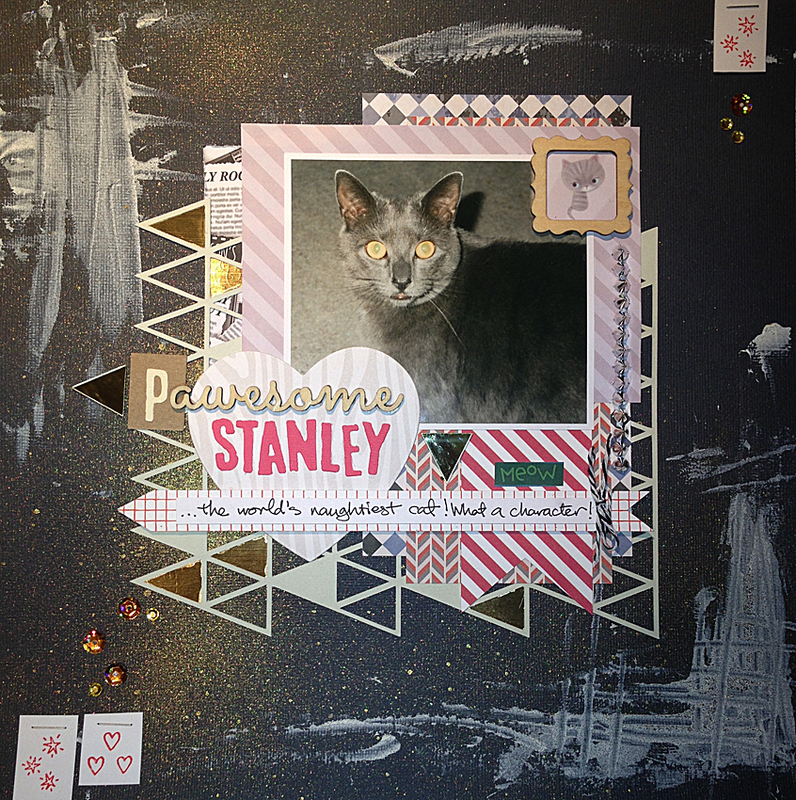 I really like the way this sort of thing breaks up blocks of colour and adds interest and the shapes - triangles, matched Stanley's spiky personality perfectly! I love my silhouette dearly and most layouts I do now usually have some form of custom-made diecut thing happening on them somewhere. These studs are from The Works - just cut off what you need and adhere! Wooden word embellishment also from The Works! 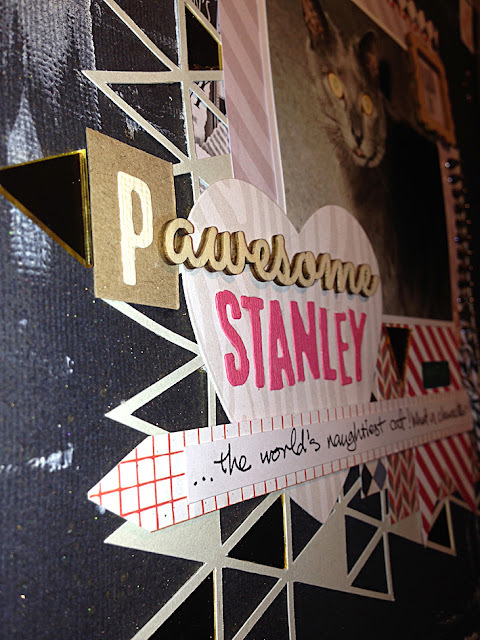 I started by spritzing the dark grey cardstock with Artiste Spritzing Ink - I love this product! The one I used is Black Gold and it has lots of gold pigment in it making it really iridescent and interesting, especially on textured cardstock. Next I added some smudges of paint but it was too contrasty so I went over it with the spritz ink again. The die cut was stuck down but first I cut out some gold triangles to show through in a few random places and tie in with the spritzing ink. 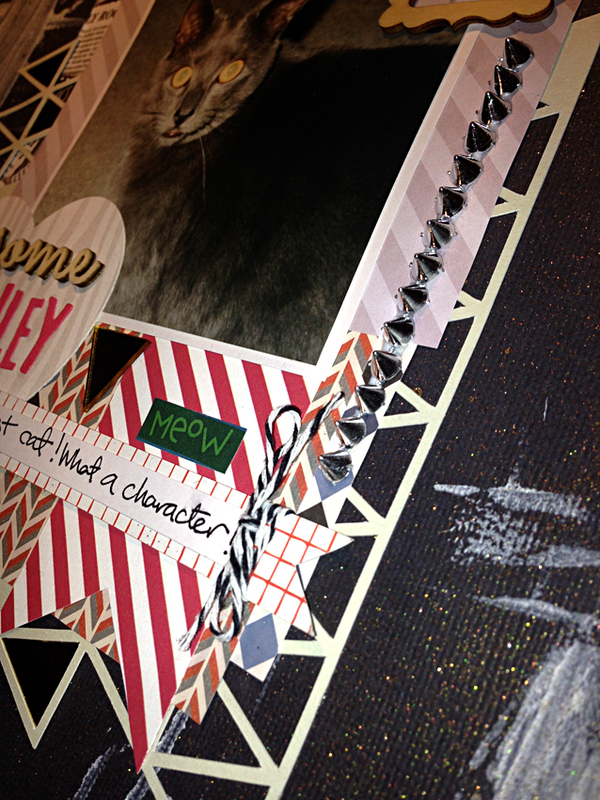 The patterned papers were then stuck down - mainly scraps from my leftovers box, and lastly my favourite bit - the embellishing!!! I have to say, sometimes The Works really comes up trumps for cheap goodies and this is true here. During a recent visit there I came across packets of wooden bits and pieces - the "awesome" sentiment being one from one of these and a sheet of silver spiky studs that can be snipped off and used individually or rows, in fact you could even try making a word up with them! Spritzing ink, gold sequins and adhesive pearls give the LO texture! Thankyou for stopping by and having a look! Feel free to leave a comment - don't be shy! 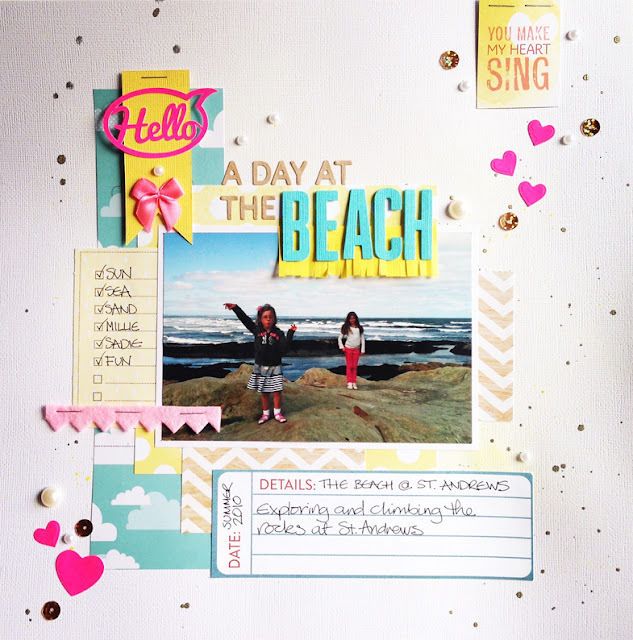 Kitchen cupboard card tutorial for you...Yay!